Here are some photos of last Saturdays group breaking at the abandoned Mill Creek site. The soil was a little tough and the weeds a little think but the grounds of a brand new native garden have been broken. Thanks to Cherry Dodd for helping us out with some plants, tools, and advice, and to all those who showed up to lend a hand. There is talk of taking Saskatoon cuttings this upcoming weekend. Preparing soil, planting native plants, and BBQing! After checking out the site last weekend we've decided to go ahead with the creation of a Native Plant Garden on an abandoned site in the MIll Creek Ravine. Plants provided by the Edmonton Naturalization Group. Need only bring a few tools. There's also much talk about having a fire and roast after the work is completed. I think a potluck scenario probably works best. BYOB. Where: Meet outside the "Rount 99 Diner" (8820-99Sst NW) We can walk to the site from there. 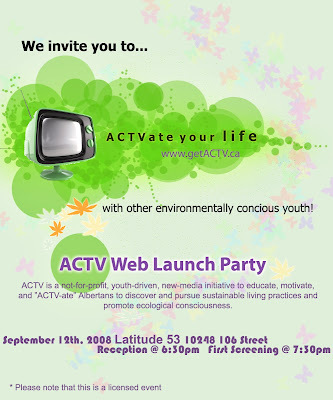 A few posts back I mentioned a new media initiative in Alberta; active citizens television (ACTV) so I thought that I would invite everyone to attend their Official Website Launch Party this upcoming Friday, September 12.